A cute and casual spring look! Happy Thursday! Love this cute and casual spring look! Casual perfection! 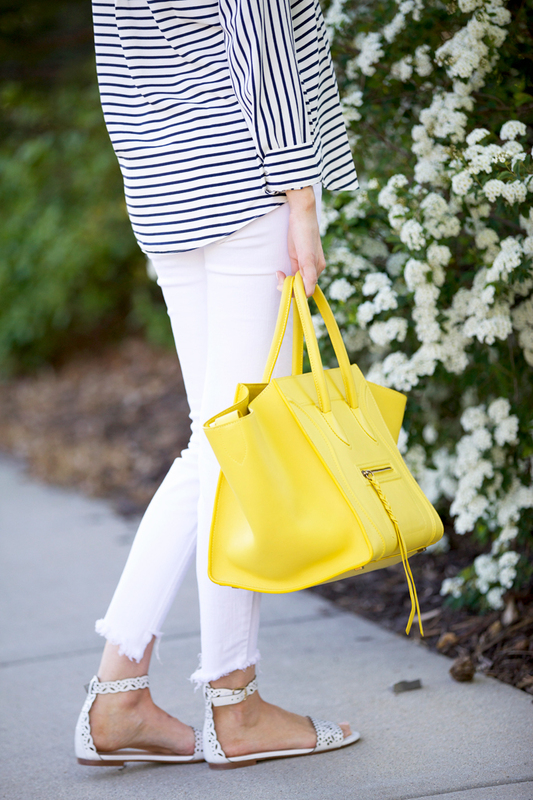 LOVE the pop of yellow via this dreamy Celine bag! The yellow bag is so cute, really great for this outfit! Such a fresh and crispy spring look and I love your Celine bag! The yellow color is stunning and so bright! Such a wonderful summery look. That yellow Celine is gorgeous! 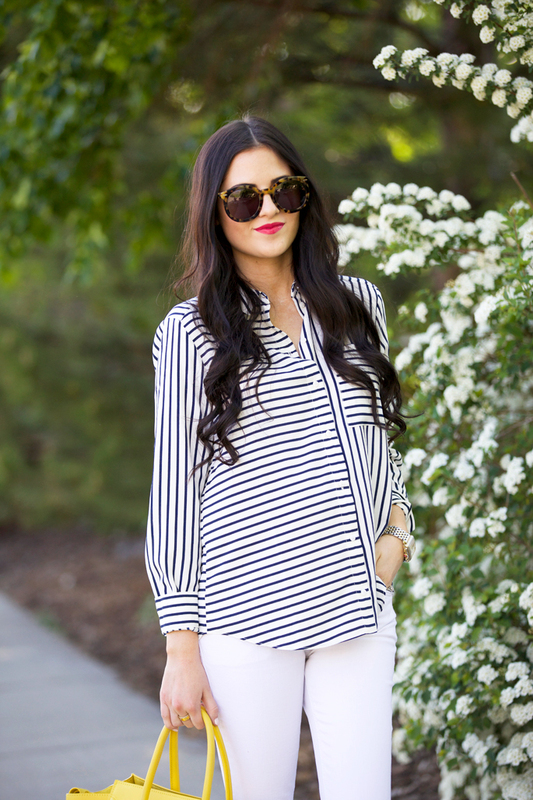 I am always on a hunt for striped shirts and I totally want to add this shirt to my wardrobe! Love it! love the color of that bag! and the shoes are so cute! I love how you paired a striped top with a more delicate looking sandal!! They pair well together – love this look! Totally saw you opening the package those sandals came in on your Snapchat… you were like seemingly the most excited about them… so it seems fitting that you featured them immediately. I love them!! Haha I was super excited about them!! I love them too :) Have a great Thursday Amber! The bag is beautiful – and perfect for the outfit! Such a fun look… That bag makes for the best pop of color! This is such a cute outfit, Rach! I love the addition of the yellow purse for a pop of color and those sandals are so lovely! Thanks so much for sharing and I hope you’re having a great day so far! Love this look – so simple and put together! 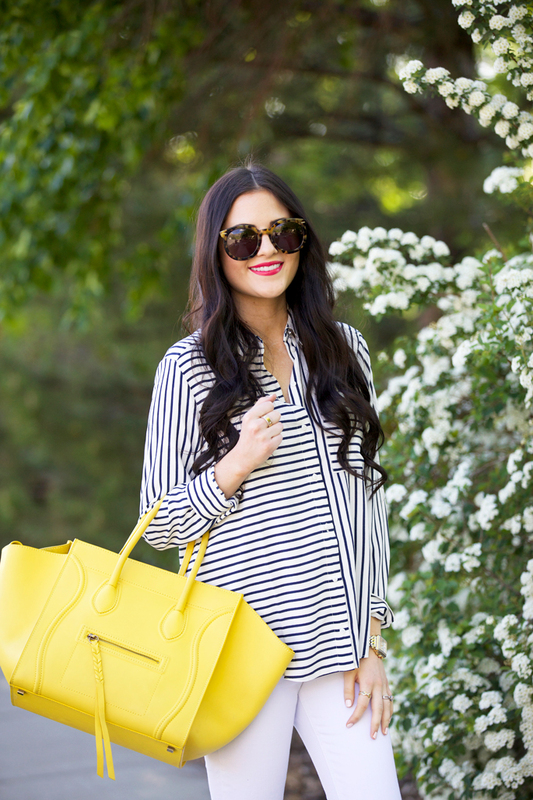 Love that striped top and the bold bag! Such a great causal look. Love the flat sandals and the pop of color with the bag…so perfect for spring! love this look! i’m also expecting and can you give tips on how you fit into your normal jeans? do you use a belly band of some sort or the rubber band trick? thanks!! So fun! Yellow is so pretty, but sometimes a bit difficult to pull off. You nailed it! 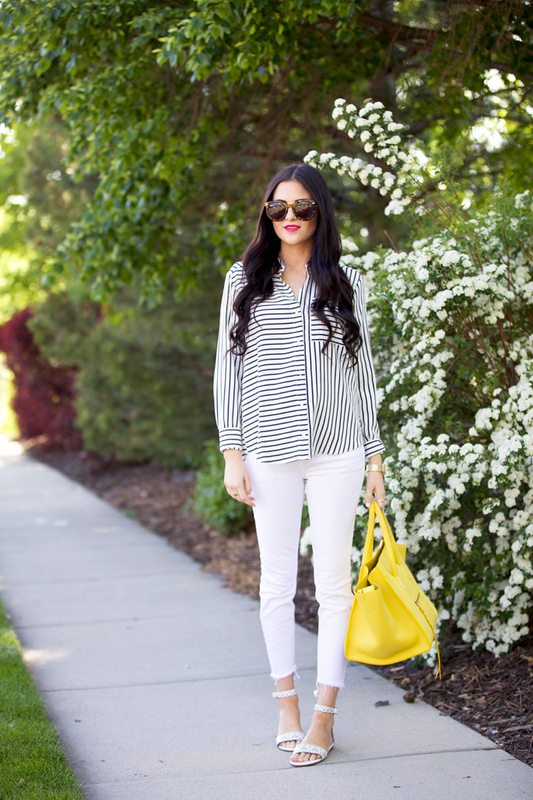 Striped tops with white jeans is my go-to look right now! Love the pop of color from the yellow bag! I love this look! So simple and chic. I need to get some white pants this season! I love this bag! The color is perfect for summer. I saw a different bag from Kate Spade but in a similar color and may be more willing to get it now. I love yellow for spring and summer!! Especially in accessories like a handbag. Thanks for stopping by! I absolutely love those shoes, they are perfect for summer! Love your shoes, I saw them on your snap chat and fell in LOVE with them! Cute outfit! Love the pop of yellow. You make pregnancy look so easy! Love the blue stripe and yellow bag combo. This shirt is so striking and cool! It looks amazing with the pop of the yellow bag. Stunning! Love this outfit! Everyone is coming out in full force with white pants! LOVE IT! Nice, casual look! Love the top! those flats are so cute! darling look! Yellow handbags are so cute & unique!! I LOVE that bag! Seriously the perfect color for spring!